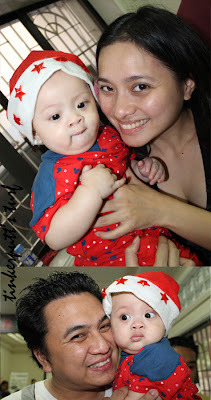 The Christmas Party for Breastfed Kids was held in the afternoon of 26 November 2011 at the Medela House. Infants below 18 months were asked to wear a Christmas costume. Ayie was not able to find a Christmas costume that would fit Jabe. 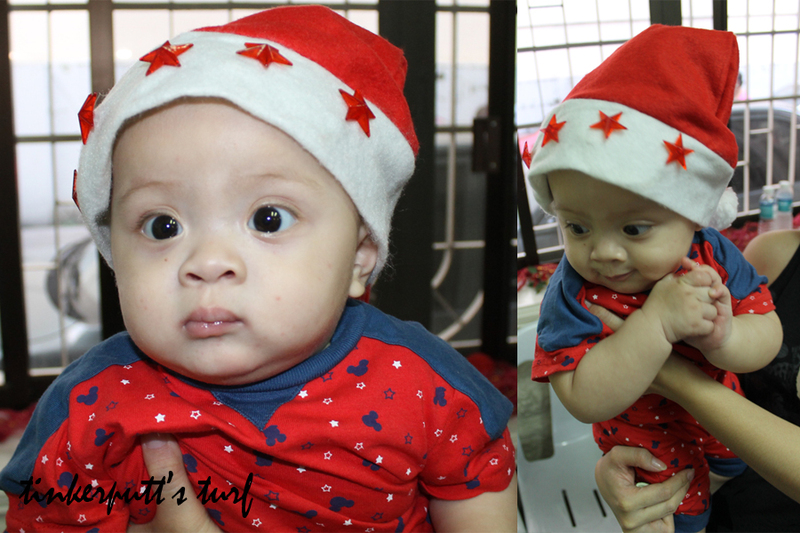 So he just bought a red outfit (top and pants) and also a Santa hat for Jabe. Venue - party venue was the Medela House. Same venue where the breastfeeding class was held. The setup was good, there was an empty space at the front for the entertainment for kids. Chairs were scattered in the area. Though we were a little cramped, it was a good thing that there were no tables, just chairs. Because you get to mingle with other moms and their babies, even with dads who were present. Entertainment - I forgot the name of the group who told stories, sang songs to the children. Jabe was asleep for the first part, but when he woke up, we joined the other moms and kids who are sitting on the floor listening to the stories as well as participating on it. Jabe enjoyed the fish story only. Then he got bored so we had to go back to our place at the back so that he will not disrupt or annoy the other kids who were listening and enjoying the stories. There were lots of games and prizes. they gave out toys and snacks, and also one week supply of Mommy Treats for moms who were breastfeeding during the program. Food - food was pansit and dessert from Mommy Treats. Best in Costume - the daughter of a mom friend won the Best in Costume. Nadine was wearing a shirt that says "Mommy and Daddy's Christmas Present!" and she was also wearing a reindeers horns. She was really cute. Totally deserves to win, the prize was a baby sling. Jabe won as runner-up together with 3 more kids. Our prize is one-week supply of Mommy Treats. A party for kids and kids-at-heart! becomes a great one if you are in the company of great people! and members of The Breastfeeding Club are indeed some of the great ones I have met! More power to you, Happy Holidays!